At some points in time, I feel the need to assess where I am.. assess what and how I feel a certain way about certain things.. my beliefs and core values. Assess, reassess and crystallize again. Have I changed.. transformed.. for the better or for worse? And also, what the "better" or "worse" means to me. Some of us may be lucky to find people who seem to be at similar situations or mental state as we are. It is good to talk about what your thoughts are and may I add, with people in whose company you know you are not being judged. And that comfort level you and I would have with perhaps one or two people. Or with no one at all. There might be times that we would have to learn some lessons on our own. Make some decisions without looking outside. Answer some questions ourselves. By knowing the one person that is most important for us to know - ourselves. How well do we know ourselves? There was this quote I read somewhere, that we don't like spending time with ourselves because we are afraid of being alone with ourselves. We'd be better off knowing someone else than ourselves. Stand in front of a mirror. And look into your own eyes. Are you able to look into your own eyes? Or are you afraid? So this friend was telling me, make every moment count. And its upto you to make a beautiful memory. To choose to be happy. At the end of it all, when we leave this realm, we'd perhaps be better off, that we did something than regretting having not done something. Live. This moment. Question yourself. Find your answers. Be honest with yourself. And take that leap within. It might be slightly scary at first. But when we surface, we'd have a new vision. Not just plain sight. Beginning January 2011 somehow I had been at the receiving end of a lot of abusive tweets from people, who predominantly tweeted in the Tamil language. Initially I ignored them. In some instances I thought I could tell them not to indulge in derogatory language and believed they would understand. Here I made my first mistake. I hadn't begun to know the behaviour of some people on Twitter yet. Here are some compilations made by someone in the past few days. After a point I started blocking them. It didn't end there. New people would jump in and Rajan leaks would either be retweeted in which I will be tagged or I will be tagged in tweets they had sent to Rajanleaks. 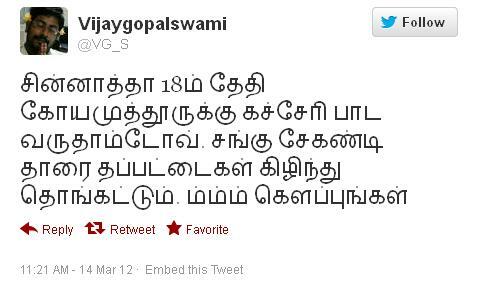 And I was known as the famous singer who blocked anyone who tweeted in Tamil. 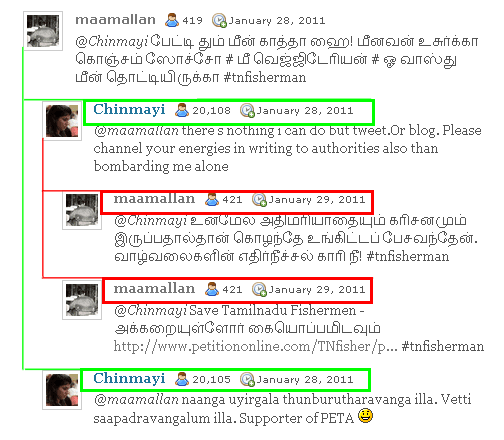 This became a campaign : "Chinmayi is against Tamilians on Twitter". The numbers began increasing and was predominantly instigated. Otherwise I don't see why people would generally join together for a 'cause (!)' like this. Manthiramoorthy alias @thalapathy_8787 also wrote a huge blog about me which ended with "I will marry a better figure than you". Apparently he wants to be directing films and had approached my mom through someone stating he would like to get married to me. Mom refused. After this description about me "Chinmayi who, you’ll ask, and Chinmayi Sripada would be the equally puzzling answer. 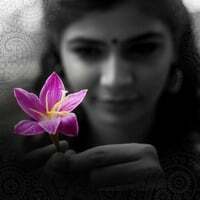 This babe from south of the Vindhyas is less known for her playback singing and more for her meticulously updated online diary of every single thought she’s ever had", he had also made a pretty insulting description about Shreya Ghoshal, which was subsequently removed after she tweeted to him openly too. The comments section will reveal that a lot of her fans were plain irritated with the way she was written about. Now I tweeted to Mr Mahesh Murthy asking on what basis he wrote that I am less known as a singer and more as a blogger. Yes I could have mailed him. But I also asked, of all people he had to include rajanleaks in this huge line-up as the sole representative of the Virtual Tamil World? His timeline was filled with profanity about most public personalities and how, in God's name was he more influential than the veteran Tamil poets and writers on Twitter. I stated Madhan Karky was on Twitter whose tweets were read by at least 10 times more people than Rajan on a daily basis and how did Rajan become a person of huge influence? He definitely said it was a personal opinion. The article also expressly states that. And then he finally said "I am not journalist from paid media owned by you (Parthiv) or Chinmayi to do your bidding about @rajanleaks or other issues". Insinuating this "paid media" with regard to me, in my opinion was very wrong, but we left it at that. Parthiv was one of the fans of Shreya Ghoshal and I who argued with him asking him to substantiate how he came up with these numbers/data. I don't regret this conversation with Mr Murthy though. I wanted to ask him why he came with this article the way he did. This irritated the people who were already up in arms against me, to no end. 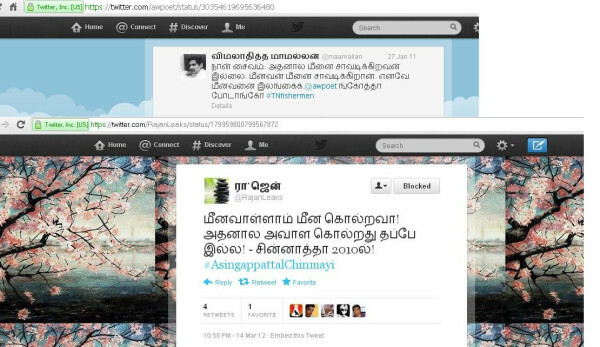 Rajanleaks started #AsingapattalChinmayi where there were some who did go up and ask that he shouldn't tweet "Asignapattal" about a girl. And the standard response to such people would be, "Why is Chinmayi your girlfriend? "(This is just a decent way of saying it). I don't know if women dared speak to him. The introduction to these guys happen in a very rude manner, explained later in this post. In the meanwhile I continued to block some tweeters. Mom and I also continued to take the advice of several people in the print and TV media, the industry and several others about what I was facing on Twitter and why this could happen. In addition I was accused of supporting one political party or the other because I refused to cow down to any of their abusive tweets on political leaders masquerading as "satire". I have been widely accused of saying things against the TN Fishermen and supporting the genocide of the SriLankan Army. I had posted the following tweets on January 26 and 27, 2011. Even to those who alleged that I said something insensitive about Fishermen, I wonder which one of these can be termed insensitive. On the 28th January @maamallan (after reading all my tweets on 26th and 27th January) said "Beti tum meen khata hai..." and I responded "There is nothing I can do but tweet. Or blog. Please channel your energies in writing to the authorties also" "naanga uyirgala kolradhum illa, thunburutharavanga illa (torture by keeping them in an aquarium) PETA Supporter." I have not even said "meen" (fish) in this tweet. However Maamallan seemed to have told a few people, right after I lodged a complaint earlier this month and Cartoonist Bala (I am told) was the first mouthpiece to spread this story amongst his readers. This spread like wildfire. With a lot of people threatening me with dire consequences. We had expected this to happen. Now he made fun of me being a vegetarian. I get a lot of that on Twitter or real life. I replied in a similar vein. Here is the tweet flow. However it was twisted and presented as though "Naan uyirgala thunburutharavanga.." was the response for Save Tamilnadu Fisherman. And here is the tweet dated January 26 2011 where @maamallan has tweeted to someone else. These are more or less the words he accuses me of saying. Cartoonist Bala propagated this on Facebook. Now after Rajan tweeted "Meenava meena kolra.... Chinmayi 2010 il" A lot of people believed that I said this. The source of the words tweeted by Rajan is this website http://www.vinavu.com/2009/09/10/nramayanam/ (Thanks to Mr Nadarajan who mailed me two days back, based on a mail part of it reproduced here "மீனவர்கள் மீன்களைக் கொல்கிறார்களே அதனால் அவர்களையும் இலங்கைக் கடற்படை கொல்லலாம்" என சின்மயி பேசியதாகச் சொல்கிறார்கள். அவர் அதை மறுத்திருக்கிறார். "மீனவர்கள் மீன்களைக் கொல்கிறார்களே அதனால் அவர்களையும் இலங்கைக் கடற்படை கொல்லலாம்" என்ற இந்த வசனம் 'இந்து' என்.ராம் பேசுவதாக 'வினவு' இணையத்தில் 2009ல் வெளியாகிய 'என் ராமாய ணம்' என்ற வீதி நாடகப் பிரதியில் வருகிறது. அந்த வசனத்தையே சின்மயியை பழிதீர்க்க பயன்படுத்தியிருக்கிறார்கள் என நினைக்கிறேன்." The #TNFisherman hashtag mostly contained abuse about politicians, because perhaps they ran out of ways to make the topic trend and they wanted the national media to take note of this serious issue. Many were agitated that national media was not reporting the death of fishermen. Starting a topic like this and making it trend would mean it would be covered by national media, they thought. When I opened the topic, I saw tweets by the very people I blocked. I didn't want my tweet to figure under a tweet which referred to a political leader in vulgar terms. Nevertheless I had already posted a tweet sending out prayers. Not many except 3-4 of my followers from Facebook who accompanied us knew that Mom and I regularly volunteereed in a fishing village near Chennai not too long after the Tsunami. We'd be there every Sunday. She went more often than I did, because on several days, work would keep me away. We still have the miniature Catamaran they gave us. Cartoonist Bala's "headline" for the article on me on his Facebook page was "Tamizhargal mugathil kaarithuppum chinmayi yai kandikkiren". A lot of people, going by the reputation (?) he has already built, believed him blindly. Now how in God's name did I kaarithuppify on Tamils? Now I hardly understand what the basis of his "sensational" article was. Perhaps this was a way to get more hits to his page. He belongs to a Tamil magazine and all that he needed to do, before publishing this was ask us if all this were true. He failed to do that. If some random person posted content on Facebook like "Krishna Tamil Tiger" "Aham Brahmasi" -( said "you may show proof, but I have better photoshop experts. Wait and see what I do with your photographs. I ll make you regret this. Better take the case against my friend back") and also Anbalagan Veerappan, posted messages, they wouldn't want to know my side of the story. But Mr Bala holds a position that comes with the responsibility of at least attempting to know the truth. He didn't. Since the day I questioned him, he has been hiding and posting this particular 'article' on his page according to his will and pleasure. This article does a hide and seek every once in a while. I am sure it will be posted again some time in the future. If some Tamil tweeter supported me, their accounts are hacked. I am amazed at this man's devious brains because he just put one screenshot and said oh She said she is against Tamilian Fishermen. He is just one of the several. I am sure there are many more. Either these guys have brains that don't work well, or they work in such a fashion to think about some of the smartest ways to make someone look guilty. Puthiya Thalaimurai debated the issue of my going to the police. Kiruba Shankar, Ms Nirmala Kotravai and Manushya Putran were panelists. My mother called in when someone told her (I didn't watch the show, I was out dubbing. Mom was watching via the web and she called in) Ms Nirmala happened to mention to my mother if you are against vulgarity ask your daughter not to sing a song like Mayya Mayya. She also is said to have mentioned she has personally received several such abuses. But she had ignored them. But I had gone to the police/press because of an "ego issue". It was sad that she trivialized it. Here I am facing the brunt of something I had not even said - accused of hurting Tamil sentiments when I had done nothing like that - and she pronounced it an ego issue. I wasn't aware of Ms Kotravai before this. I hear she is an activist. She also mentioned she has ignored tweets like this. Its fine to ignore tweets/calls/EMails which I have been getting, ever since I became a playback singer (I guess I have to clarify: 2002 onwards calls/SMS/EMails/comments on my blog, After twitter came along, tweets), but when it becomes this ugly, I'd be a fool to not seek help. We had been discussing this issue ever since it began, with several journalists, friends and those in authority. Trying to find out how serious it can get. "மீன்களை மீனவர்கள் கொல்லுகிறார்கள். மீனவர்களை இலங்கை கடற்படை கொல்கிறது. இதில் தப்பென்ன? #அருமையான தத்துவம்." We first went to Cyber Crime in March, when I tweeted I coming to Coimbatore for a concert. * Chinnatha is the nickname given to me. Now the conversation continued to "she'll never be able to sing anywhere again". Now, after a tweet like that, we didn't know whether they could be serious or joking. Yes, they could definitely be joking. But what if they were serious about this? What if the organizers were put to trouble? We had to seek help but also added to the authorities the same and also that we don't want to avenge anyone. She also spoke to a few people over the phone requesting them. As they ceased to be part of this bullying, those who wanted to abstain would be in turn be bullied to "join.. or else..."
And I posted this http://www.twitlonger.com/show/jnt8q8 after which "Tamil Aman" mentioned above asked did you speak against the Fishermen? Now after this, everyone wanted an individual reply. If I didn't, they would start off on posts and tag everyone in their circle. I also realize now that they'll probably come up with something new. Each day. As for the reservation my response was to ONE girl who said she couldn't get a seat inspite of her marks as she was in the OC and her parents didn't make enough to buy her a medical seat. Empathising with her was the crime which hurt the sentiments of several people. When I said "so called inferior people" (Added: Thaazhthpattavargal was a word I had misunderstood as the Tamil word for "inferior" and I didnt know that it was a word to denote the oppressed. Someone had tweeted to me even during the 'argument' saying I am wrongly using inferior and inferior-ized. This tweet came from someone who understood what I meant and what I wrote and pointed out the mistake. I have only repeated that I had wrongly interchangeably used thaazhndhavargal and thaazhthapattvargal a million times to Rajan or his sympathizers. I also said that it would be better if I tweet in English so that I don't say the wrong word again. My argument was that there is no such thing as an inferior man). However this tweet and the other tweets that I wrote are missing from the compilation. - I meant that I don't understand why anyone would be called inferior. How is anyone inferior was the question. There cannot be inferior people I argued. All human beings are superior creations. Now I was a fool talking philosophical words to someone who didn't want to get it at all. And I had no idea that all my words will be distorted. There is also a compilation of the tweets on one blog. Carefully edited, tweets posted out of context as replies and this was the same conversation that contained "You need to be raped.." . I m not surprised that this particular tweet along with others were Rajan repeated "naan madha/jaadhi veriyan" throughout the 140 characters are also missing. I have always maintained I wish for an equal society. I debated the two tumbler system on Live Radio on Aahaa FM, manual scavenging and men cleaning sewers manually even after court orders, 4 years back. I said on radio there is no such thing as a superior or an inferior man. Every man is a superior creation. How is it that the same people who believe caste should not exist and are against the caste system, kept abusing me citing mine? How is that fair? Of course, all this is happening because a good number of people lack the sense of fairness. "Why are all singers Brahmins?" "Why do reality show contestants speak like Brahmins?"" Why are brahmins here, why are brahmins there?" I have maintained that I don't know how a Brahmin is defined. Yudhishtra says conduct makes one a Brahmin, not birth in his tryst with Lord Yama. (Amar Chitra Katha). The one that walks the path to know the supreme being, towards enlightenment is the one who is a Brahma-chari. The story of Chokha Mela - God has proved to man each time that there is no such thing as a low caste by identifying himself not to the priest in the temple but the man sadly denounced as an untouchable. God only recognizes the one who treats all beings equally as his greatest devotee (Rantideva - Devotees of Vishnu, Amar Chitra Katha). Why should I identify something that is created by man? I have never trivialized someone's suffering. Never would I ever intend to. It is heart rending to read the accounts of people who have had their "spirits broken" (the words in quotes were the very words of a friend of mine) by those who believed they were of a higher "birth". I wonder what makes one set of people believe they are greater than fellow human beings. Aren't we all conceived and born the same way? Did some people drop down from the heavens, as a full grown adult? Women were not allowed to be educated because an educated woman would mean her husband would die young they said, not too far before, just around 1940-s. It was all convenient for a lot of people to create such ideas and for others to follow them. A Dalit woman is raped and her case is not even lodged which is also reported in the news. I tweet about that. However, this is overlooked. Discrimination is still continuing in this age where we believe education has seeped through society, people have become forward in their thoughts. But no. So many haven't. Its distressing to know that. In these 2 years I have learned all (That is all, I hope) the profane words and adages people have for a set of women starting with "paapaara....". Now that the fishermen issue cannot be taken forward, the reservation issue will be taken up and it shall do the rounds. And people will again take the name of a caste and say "Thimuru". Also Rajans and Saravana Kumars are entitled to say whatever they want because they have the Right to Speech. Finally so many public personalities in Tamilnadu have been accused of hurting Tamil sentiment, misquoted and also told that they are not Tamil at all. I shall refrain from taking names here, but they have all been really big stars. I wonder if I ll ever be there. But never in my dreams did I believe that a few people would gang up and put in so much time on all this propaganda against me. Sadly, but not surprisingly, people believe them. As of today (I started saying at the end of it all, and realized it ain't over yet), I have realized one thing. I can just sit in one place, not say a thing. But even then I could be in the eye of a new storm. I also do wish the underlying motive behind all this would be brought to the fore. Why would random people make up stories like this? I pray with all my heart for justice. When I usually open the 'compose' page on my blog, I have the words running through my mind. At least a couple of paragraphs would have marque-ed in my mind's eye before I see this blank canvas, ready to spill out through the keyboard. Today however, I did feel the urge to write but for once I didn't know what about. The rains have in their wake a stillness that I sometimes romance in my mind. Only wish the stillness were in my spirit too. You know, all the divine romance thing, I spoke earlier about. Sometimes being a restless spirit is nice. But sometimes, I visualize gazing long into a silent, shimmering lake, sprinkled with moonlight, seated on a wrought iron bench in a lovely lawn. Perhaps just before dawn. When it is rumoured to be the darkest. And then it would be nice to see the silver streaks replaced by liquid gold flowing down from the skies and on to the surface of the lake. Fresh morning air and a promise of brightness, hope, clarity that each dawn promises to bring. The promise of a new day. Perhaps a day that shall usher in a crystal clear mind that shall not be rippled even when several stones are hurled at its waters. And for that day, I wait. You know, when we were children, our parents protected us, safeguarded us, cared for us......well you know all that they do. I dont really need to list it all out. But I see there comes a time when we realize that a role reversal happens. There comes a time when we realize we need to fight battles for the ones that fought battles for us. Don the armour and brandish swords maybe. Dramatic no? But then even if I have gotten carried away there I somehow feel its true. Mom has been a go-to person for several people at various junctures in life. For the way she has brought me up, the struggles she faced alone, and standing tall with integrity, dignity and a head held naturally high because there was really no reason to lower her head except at the altar. But then I am the kind that takes pride in saying that if God were to stand in front of me I'd look at him eye-to-eye and ask him a few questions. Most and if not all, on behalf of mom. I have noticed one common thing in several celebs lives. The one family member who is involved in management gets a lot of flak. For something or the other. The thing js the world will counsel you to get an outsider. I mean seriously, an outsider will care for you wayy more than uour parents is it? And I am speaking of decisions I made, (my field, workdpace, et al. No comments intended for anyone else's life/career) and wasnt too keen on having a manager. AND the entertainment / music industry is not ready for a manager in my opinion. No singer has a professional manager. If they do, it is family. I truly believe thats the best. There's absolutely no reason for an outsider to know your life. Afterall this thing called loyalty doesnt exist these days, no? The doctor discusses your medical history with someone else, (I knew of a psychiatrist who discussed his patients), the auditor the finances, your driver the movements, your househelp discusses your views on your entire family (if you discuss things in front of or with them, that is) thats all there is to it. Coming back, yet again, somewhere in between I ventured into my usual tangential randomness. So the thing is I think, from an observation of someone today, there does come a time the cubs will have to realize they are grown up enough to protect their parents and I m not just talking of the physical aspect of it. Jokes apart, I hope you the reader will know, identify and act accordingly on a day that might come when you need to stand up for your parents and go out, all guns blazing, if need be. Arent (i ll add, barring a few exceptions) our parents our best-est well wishers? And don't they deserve the care that only us children can give them? And on another tangential note I wish no elderly person ever be unhappy and away from their children against their will, and in a retirement home. And I wish that every elder is taken care of and that every family in the world be happy. And that they all live happily ever after. Tathaastu. One of the most important things any person in a public domain is told is to watch this and watch that. I mean, everyone has phones with a video recording facility. And there are twerps who install cameras in restrooms and upload them on YouTube. So much so that when we travel abroad on concerts, we don't stay at hotels. And also, I learn that the fundamental right to expression and speech really doesnt exist, more so for people who everyone watches. But true nonetheless for everyone. You cannot freely discuss something for the sake of argument/learning wondering if it would hurt some said sentiment somewhere. Sometimes I ReTweet a link so that people (whoever is interested) could read an opinion about something. Now depending on sensitivity or perceived sensitivity, I would immediately get warnings, be careful, or you'll be trolled. Now I think I could have a masters degree on being trolled, especially because, I belong to a certain 'caste'. Its amazing how uneducated people are inspite of their NRI status. Nonetheless I am just thinking/realizing that there really isn't anything called freedom of speech. Not with your friends/family. One will only have freedom of thought. You can think whatever you want. We just need to watch how we (if we do at all) verbalize it into words. Lifetimes are spent, without expressing what we want to. We fade in. And we fade out. And maybe even the concept of freedom is imaginary. Unless and until one is a realized soul. Only they have the good fortune after hours of practice, to be truly free. For most where self-realization is not achieved, life perhaps passes by and is lived, with the mute button on, in most cases. Sometimes this thing called divine romance is well, romantic. To romance the idea of being free of attachments and being one with the supreme being. The romance of imagining the freedom, bliss perhaps that may come as a result of one such thing. The concept of chinmaya. The supreme wisdom and realization that results in profound joy. Nirvana also I guess. Or one can romance the idea of living in a guile-less, deceit-less, pure, crystal clear world. Where green is the sparkling, bright, green that heals the eye and fairies fly near humans. Where morning dew is sprinkled with fairy dust and a rose with a scent heady enough to drench the surrounding town. Sometimes I imagine floating up, into the inky sky speckled with stars, in the hope of finding that stillness. A stillness I really not know of but might be able to identify when I come face to face with it. There are times I romance the tears, for there is no such thing as heavy while it rolls down your cheek, perhaps in a solitary trickle. Perhaps in two or three. And no such thing as the lightness it leaves behind as it dries out. There are times when I romance the fabled bliss that saints seem to have achieved. High up in the lofty Himalayas. And there are times I romance the mountains, times I romance the lakes, times that I romance the imagination of watching the fast and furious world from outer space. I romance being away from myself. Far away and just watching this human being walking around in the name of Chinmayi. Doing all that she is supposed to do. Quite recently mom and I decided to do away with the concept of a Pooja room. After all, rituals are perhaps one of the first levels in God realization. There has to be a point where one has enough focus and concentration to do the pooja in your mind. My romance with temples and religious sites will never end. The other day reading how Krishna explains the concept of Maya in an Amar Chitra Katha (Tales of Narada) made me think how weird it is. What we own, owns us. Ain't it? Or does it? Having read enough and more literature on past life regression on how people feel in the after-life, or even other than that, I am one of those people who speaks very nonchalantly of death. I mean I think its a liberating concept, based on all the literature I have read. And also based on some of our own scriptures that all this life and death thing is a cycle. Apparently even in the Tarot, drawing the card of Death usually means a new beginning is around the corner. But more than anything else I guess I romance the idea of the pitch perfect note and the truth in it. And truth itself. The agony would be in the wait though. The wait for the truth. And liberation. There is a reason I am writing this post. To tell you about a couple of people I came across in the virtual world and whose mails would land on my inbox, all mostly uni-directional communication. There were times I would try and reason out and then figured it was useless and of course mom would be informed of all these mails. Interestingly these men would CC to mom as well, so it kinda cut some work for me. I shall be polite enough to not disclose identities, but this is an FYI to everyone who is finding a groom (I can only talk of personal experience) for their daughters. So I am regular on Twitter. You, reading this post would know that, I presume. I tweet randomly about something under the sun, or RT something, Mr X1 assumes it is all for him. And sends me a mail, asking why I am indirectly tweeting to him. Initially I responded, since I usually respond to most mails, when I have the time, asking what this was in reference to. He says I know you love me and that's why you tweet all those things. And this was the beginning. It went upto "ASK AUNTY TO TALK because I am looking at what is best for OUR future". He also claimed his family knew about it. Now I don't understand how his entire family would go with "all her tweets are indirectly for me and she loves me". Some mails would be downright vulgar. Some abusive. Then he says "Your time is UP! I am going ahead with my life now since you failed to respond!!". Then he would blame me for the excessive depression for 2 years he went through because of me. Last heard a mail claiming to be from his mother lands up. I seriously doubt if it was from her, or if he mailed that himself too. Nonetheless that's that. Guy X2 calls my mother Athamma, has told his family he is 'fixed on marrying me'. And asks me "Why do you want to be a heroine? If you want to be actress you'll have to forget me and our love". Oh, he also believes all my tweets are indirectly for him. Now God only knows when I said I want to be a heroine. Don't even ask about the "our love" part. Then he graciously compromises and says "Chinnu you can be serial heroine. I ll be OK with that" or something to that effect. Then one day I just RT an image of a wedding ring which leaves the impression 'MARRIED" on your skin if you have worn it a while and have removed it. And X2 says "Our wedding ring super ra.." For a second I was taken aback. What wedding ring?, I shouted in my head. And then I put 2 and 2 together. I made 4. He made 7 1/2. I think its all because of some 7 1/2 that I am going through all this. X2's mails are particularly hilarious and worrying at the same time. I get a dozen mails a day from him. Today's mail read, waiting eagerly for marriage with chinnu. Sigh. I am not writing about this for entertainment value. But because, today as an adult, I shudder to think, that these 2 guys, (there have been a few others who were on this delusional trip including a man in his mid 40-s, but I shall stop here) who are educated, one of them studies abroad in a reputed university (! ), seem to come from sound backgrounds and look absolutely fine, go on such trips and these are the kinda guys will marry some unassuming girl somewhere. I even tell people, that being who I am, its extreemely easy to find out about me. For the said 'background checks' you know? I m in the public domain. Easier to find out about me. But I on the other hand, will never know about a guy or a family posing to be normal like X1 I mentioned above, I would never know if he was stalking someone, has some obsessive pattern of behaviour, what the actual intentions are... well I can go on and on. To you reading this post, if you are single/unattached/about to be hitched, whatever. I ll tell you this, from all the advice I have got. I am not so sure about the better to have loved and lost than never to have loved at all. I have seen people I know go through hell, when they lost. Some still do. Its perhaps easier to follow the heart and enjoy the butterflies. But please do follow your head. Think it through solidly. Speak to adults if you are young or even if you think you are old enough. There are not too many things in life that experience and sound advice can replace. Its great if that can come for you from within the family. I have mom first. We have made quite a formidable team as I see from general public perception, now that I am considered to be in 'the marriage market' (bleargh for that term). And it is also funny to see how many people are insecure because of the kind of a bond mom and I share. Pah. Too many people cannot understand the Guru and the mother concept. We also have a few close people who are my mom's well-wishers and friends. A circle who has seen us through all these years. Non-judgmental and razor-blade honest. Follow your gut instinct and always, always listen to the inner voice. Don't ever ignore it. And be careful. Very careful. Please don't marry because your great-grandparents want to see great-great grandchildren. Or because of social pressure. Things were simpler until our parents' time I think. It is not so now as I am told and as I myself see. We marry not the individual but the families too. If you think you cannot like the family, then the marriage is going to be difficult, and if you plan on having children, know that you cannot tell your children later to stay away from their own family. This was another advice given to me and I have also learned from observation, looking at some unhappy people and children and decided that is not what I want. A week back when I was in Hyderabad on work, a man married for 8 years said, you could know someone for years before you re married. But after you are married, you discover a whole new person. As for looking through matrimonial sites and getting to know total strangers and marrying them, I personally shudder at the thought. But I know there are people who are very happily married this way too. Perhaps its all destiny. And fairy dust. And all that. I do believe its better to be single than be in an unhappy marriage. I wrote about X1 and X2 because there are times when you may meet a seemingly normal person. But there are things one might never know. And during those times, they say some alarm bells ring, something doesn't feel right. Don't ignore that. Follow your gut instinct. And there are times when the background checks will never find out if someone had some behavioural anomalies like those I mentioned above. And finally to you reading this blog, if you intend to marry, may God give you a nice person and a beautiful family to marry into. If you don't intend to, which is an idea I court (mom is gonna kill me! :p) well may you be happy even then. Tathaastu! I was reading the Amar Chitra Katha title on Aushadha Kumar, a reincarnation of Bodhisatva. Thanks to his wisdom and his growing popularity in court, the other ministers became jealous of him and unsuccessfully plotted his downfall as often as they could. One of the ministers, Senaka, was usually the mastermind and incessantly tried inspite of his failed attempts to defame Aushadha Kumar. In one of his attempts, he asks Aushadha Kumar, "What must man acquire?" AK replies, "Truth" and then, Wealth, Mantra and finally the ability to keep a secret". How Senaka uses these responses to plot another wicked plan against Aushadha Kumar forms the climax of the story. What struck me here was that, acquiring truth, which was mentioned as the first on the list of things AK says man must acquire. I am wondering if that was taught to us in school. Or while growing up. As we became adults, we learned first hand, that truth was usually the first thing to be sacrificed in several instances. One of my personal, most important quests is my search for truth. Of the past. The present. The future. Depending on the day, its either at the back of my mind or the only thing on my mind while I go about doing other things that I routinely do. We do everything possible to acquire wealth, some of us acquire mantra, depending on the family we are raised in and retention and practice of it depends on our own convictions we form as we grow up. The ability to keep a secret is truly rare as much as I know. I am not sure how many people I know one can trust with a secret. There are some things I believe can completely change this world. And perhaps topping that list would be truth - in my opinion, of course. I could be absolutely wrong. Perhaps compassion and love would be better candidates in changing the world. And after typing out all this I have a feeling this post is so random. But then published it shall be. We happened to find letters that are over 2 or 3 decades old and reminisced about how, perhaps things were nicer in a different age. Mom said, we just pick up the phone and talk these days and there is no real record of communication and the art of writing beautiful, handwritten letters are just almost gone. Enough and more has been said about all this mobile radiation hurting the ears and the brain and all that. Whether that is true, whether there is scientific evidence, or whether that is a conspiracy theory or not, it doesn't matter really. I know its not possible to do away with the mobile phone, at least not yet, but I want to see if I can minimize using it. At times I feel like I am watching my own life go by. Like watching a train chug away. And at times I am the participant. Centre-stage, with the spotlight on me. Someone said Happiness is but a choice away. And I wonder if it all is really that easy. Or do we just pretend everything is OK, like we have become immune to all the wrongdoing all around us, happening to us, or to people we know or to strangers and move on to yet another day, yet another challenge or something mundane? Someone I really respect asked me to smile more often. And told me to be happy. Just about a week ago. That's when I wondered did I really forget to smile often, or was I never really the smiley-face kind? Not talking about smiling for photographs but more so in real life. Coming to think of it, some photographers struggle to get the smile out of me. Poor things. Anyway. I guess, more than anything else, I am the kind that watches. Observes at times. And takes a lot of things in, silently. I look for signs of synchronicity. Or signs that signal something or the other. But then I do get some message or the other from the heavens above. I guess at this point I want to veer into writing about following your instinct. But I shall reserve that post for another day. It will contain several 2 cents from various people. In an abridged manner hopefully, if I get around to writing it well. Just giving this post a once-over, I wonder if I really got around to saying anything concrete, but, I do wish for you reading this post, that I hope you find what truly makes you happy. As soon as possible. I wish for you that you don't have to pretend to be happy (if you are that is) and can truly be joyous and may there be joy all around you. I wish for you that when you go to sleep each night, you fall asleep with a smile on your lips that radiates from your heart. I wish for you that when you wake up each day, you see sunshine and joy. And just so that as human beings, lest we forget, I also wish you a tear or two, once in a blue moon and that you'd have several hands to wipe those tears away and may you live happily ever after. As we all believed as children, in happy endings. P.S. : Random thought. Do boys also read fairy tales? But then I guess if they didn't while growing up, I guess as fathers they would have read one or two, for their children... ah well. Me and my train of thoughts. a Bookstore which sells ancient and rare books of India? Please do let me know. The other day when we visited someone, I saw a kid, perhaps around 5-6 years of age demand in a loud voice to his grandmom "Where is the 500/- that I kept in my box?" To which the lady replied, "You were the one who gave it to me last week, isn't it?" And now the upstart of a boy demands again, "You better give me the money right now" And the grandmom says "I will give it back to you with interest, don't worry" Now the boys starts throwing a tantrum. The mother of the boy watches this entire exchange with a smile on her face and doesnt move an inch to reprimand the kid. To say the least, we were stupefied. What is this concept of a 6 year old who has just learnt to talk full sentences demand 'his' money, from his grandparents? And what is this concept of the parent just watching this like it is entertainment? In another case, the parents of someone I know hardly care where their son/daughter goes. And the kids hate being questioned, "Where are you/when will you be back/whom are you with?". The response from their side will usually be rude "What the hell..... blah blah blah". Now the thing is, I have been told and taught to report at each given instance about my whereabouts to my mother. The concept of reporting simple things and at times, even important things to elders has probably become extinct today, that I find myself not able to gel with people my age and even looking down upon attitude problems between peers and their parents. "Araatthu" is how such youngsters have been termed by parents I know. The thing is, what prevents parents from reprimanding their children? Or what prevents children from obeying their parents? Is it because the parents have lost respect with their children at some level that these days in arguments between families reportedly, there are people who say "its not as if your parents are amazing". So, is it that if one decides to follow values that their parents perhaps didn't in some instances, immediately the retort and insults begin with the parents each other's families. In an instance of marital discord that I heard of, the first person that the man insulted was the girl's father. "Not that your father was a great man that you can question me". Now this sort of an argument I find bizarre. Is this simply an offense is a defense mechanism sort of a thing? I remember, even when my grandfather was some 89 or 90 (he lived to 93) my mom used to go and ask permission , not announce about what she is about to do, but ask permission on somethings and ask what does he think about it? The same exercise would follow with my grandmother. Though my ammamma would eventually say "Nee enna pannalum seriyadhaan pannuve Paddu". When I was younger I used to see my grandfather and mom agree to disagree on issues/decisions. And when I said anything remotely disrespectful (owing to something that I could have imbibed from school or other kids) my mom would be right behind me to twist my ear and make me apologize. Sometimes my grandparents used to tell me not to mingle with a couple of cousins, much to their ire, not that I blame my grandparents or the cousins. But that was how it was. Maybe their blessing is taking me forward. I hardly see parents reprimanding children for their bad behaviour these days. Why? Instead, they smile, giggle and laugh it off. I had huge issues like these when I was hosting this reality show on TV. I saw terrible behaviour from kids. Maybe their parents also couldn't handle media attention. Suddenly we were asked to refer to a 12 year old boy as "Sir" by his parent and interestingly the father himself referred to his own 12 year old son as "Sir". I see the trend continuing with some other parents who think their kids have become too big. Now I see a huge chasm in the way my mother used to insist on several things with me, which have now become a habit and others who don't follow it. At any given point in time, my mother knows where I am. I know so many other parents who don't know and don't seem to want to find out. Is it fear of being insulted by the kids once more if they ask "Where are you?" or "Where were you?" or "Where did you go?" that they'd rather keep quiet and not ask? Is it the parents' inability, apathy or the fatigue in dealing with the disrespectful attitudes of their own children. Or have the parents at some time failed to lead by example? Could that be the reason? I guess I have become even more critical of parents who cant discipline their children or teach them how to behave, especially post my experiences on being a presenter on a reality show that dealt with kids. Needless to say, I have criticized the attitude of some contestants openly when they spoke in a certain manner to the judges or anyone else. I, however, to most of these contestants was 'just' a compere. And I was to be treated differently than they spoke to the directors/judges in the show. I also saw how contestants knew which side of the bread was to be buttered and so many other things, in short, something I guess would be called street-smart. By the way, this is a comment and not criticism and I so wish I had had the street-smart, sweet-talking capacity that I saw in contestants ranging from 6 to 24 in Super Singer, in myself. Being street-smart is clearly a talent.I remember that some of the crew-members and I had kinda decided to not send our respective children to school, if this is the way the kids ultimately turned out. But then whats the point in blaming schools? There were times when the crew would say "you cant understand what those kids are saying, they are beyond all of us.. namma ellaarayum vithu vellam vaangitu poiduvaanunga". It was funny then, this entire thing, but in retrospect, I think its worrying. And obviously no one would care in correcting behaviour because who wants to get the 'bad name'? Which is why even judges are scared of criticising kids on any reality show. Why should they get the bad name from a general public who misunderstand encouragement and criticism for betterment? Judges are only expected to praise, praise, praise away even very mediocre talent. And no performer will want to jeopardize his popularity quotient by criticising children/contestants in a reality show today. There is a huge difference between encouragement and wanton praise. And praise at that fledgling level never got anyone anywhere. This however, time will easily tell. Eventually the people in the business/art know that the one who makes it would have gone through the grind and there is no short cut. In the meanwhile however, season after season contestants come and contestants go. We know where they come from in most cases. But God knows where they go. The channels would only be interested in the next batch. The older batch is forgotten the day the finals happen and all is done and dusted. Sadly upstart behaviour from kids has become the norm. And the few like me who have grown up with strict discipline have become outcasts that I am afraid to even remark or even have a ludicrous expression on my face. True like they say, this is not the era of values, ethics or even basic things like having an innate respect to an elder. And many a times, I feel like I am stuck between a rock and a hard place. And these are instances where I feel I truly don't belong and feel like retiring to the hills :p hehe.